My husband and I do not eat out very often. We both learned years ago that we are able to save such a huge amount of money simply by eating at home. We still enjoy eating out occasionally, we just try to do so frugally. It is possible to enjoy eating out at restaurants from time to time, even while being on a tight budget. 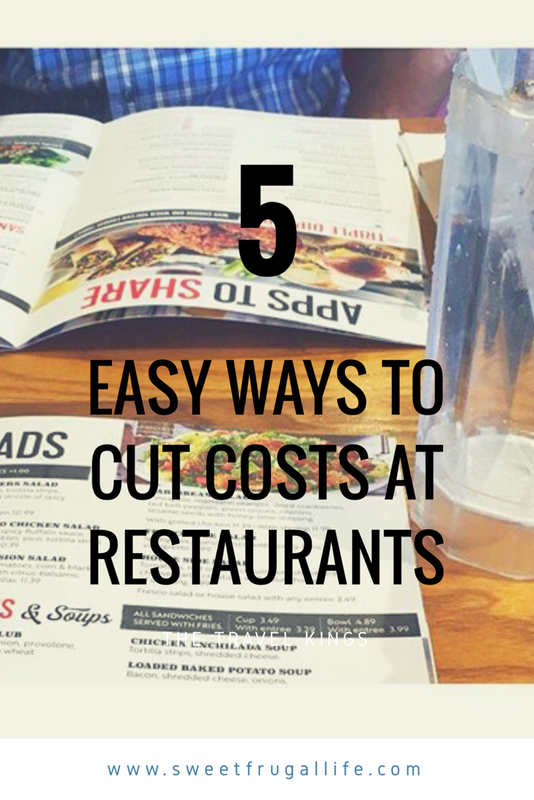 The most important thing is to include the expense in your monthly budget and try to cut out a few common restaurant costs. Go out to eat for lunch instead of dinner. A lot of places will have cheaper lunch options to choose from. You will also be much more likely to order a cheaper meal, such as a sandwich or salad if it’s during lunch time. Order water instead of ordering a drink. I will usually request a lemon in my water so I feel like I’m getting something slightly fancy. 😉 Always skip the appetizer and desserts as well. They are both very overpriced. Try to order a big meal to fill up on instead. Become familiar with your local restaurant deals. A lot of restaurants will have kids eat free nights. Our favorite Italian restaurant offers buy one entree get one free during a certain day of the week. Find out the deals in your neighborhood and plan your outings around those days. Only eat half of your entree and take the rest home for another meal. This way you get two meals for one price. Or, you could split the entree with a spouse or friend. Most restaurants will be more than happy to serve you one meal with two plates. Consider ordering an appetizer instead of an entree. Appetizers are usually much cheaper than entrees and still provide a large amount of food. Look for a restaurant with a trio appetizer for a well rounded meal. It is possible to still enjoy eating out at restaurants while on a tight budget. It takes a little self control and some planning, but it is still possible. Hubby and I have weekly budgeted date nights (the key word here is “budgeted”!). I’ve purchased the Entertainment Book for our area (some years at a discount – remember to use ebates). You could also ask for one for a Christmas/holiday gift. Use the coupons for meals out plus there are many store coupons in there. It also lets us try new places in our area. I figure if we’re going to eat out, I’m going to try to work some kind of deal to get us a reduction in cost.